﻿ Top Exhibitors At This Upcoming Maison et Objet 2019! The best exhibitors at Maison et Objet 2019! Maison et Objet features some of the best interior design brands in the world, from all corners of the world. At Maison et Objet, the sky is the limit and you are able to meet every piece and every Stand. SEE ALSO: Norvik Bank Gets A Touch Of Mid-Century Lighting! Easily one of the best ambassadors of Portuguese design, Boca do Lobo is returning to Paris for Maison et Objet 2019 to showcase a brand new take on the modern home decor. With a strong design and craftsmanship as the cornerstones for Boca do Lobo, this brand has stunning new pieces in store for all of us. Boca do Lobo Stand – Hall 8 – C3. 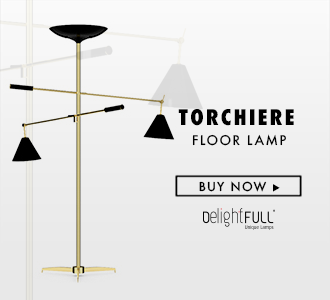 One of the pioneers of the mid-century lighting style, DelightFULL, has been around the high-end lighting market for over 10 years. Inspired by the mid-century period and jazz/soul music. Every lighting piece they have is a product of beautiful design and background. DelightFULL Stand – Hall 6 Stand 092-P91. Brabbu is a design brand that has a vast catalogue of different pieces that can fit in almost any modern setting. With a strong character and power in their urban lifestyle, Brabbu aims at recreating unique experiences in every single piece they design and produce. With high-quality materials and innovative techniques, Brabbu brings personality and comfort at Maison et Objet. Brabbu Stand – Hall 6 Stand H38 – 137 I H48 – 147. Essential Home is DelightFULL’s sister brand, a furniture brand that also shares that mid-century design philosophy with DelightFULL. Blending mid-century styles with contemporary influences, the end result is timeless pieces that can fit in almost any modern home. Essential Home Stand – Hall 6 Stand O102 – P101. Focusing solely on bathroom decor, Maison Valentina aims at uplifting this particular room, with high-quality designs and craftsmanship. With fresh takes and exciting news ready for Maison et Objet, Maison Valentina offers anyone the opportunity to bring luxury and uniqueness to every bathroom. Maison Valentina Stand – Hall 7 Stand E42 – F41. Circu is, most definitely, one of the most unique and entertaining brands of all of the brands at Maison et Objet. Circu focuses on children’s bedroom decor. With playful and creative pieces, the designs are created with a childish view and the end result if just extraordinary, a must visit at this Maison et Objet! Speaking of high-end lighting brands, Luxxu is definitely one that pops into our minds. Luxxu is destined for any luxurious establishment, or home that is looking for a piece that can look wonderful and uplift any room with style and class. Luxxu Stand – Hall 8 C85. READ MORE: Norvik Bank Gets A Touch Of Mid-Century Lighting! Pantone Colour Of The Year and Home Interior Trends!